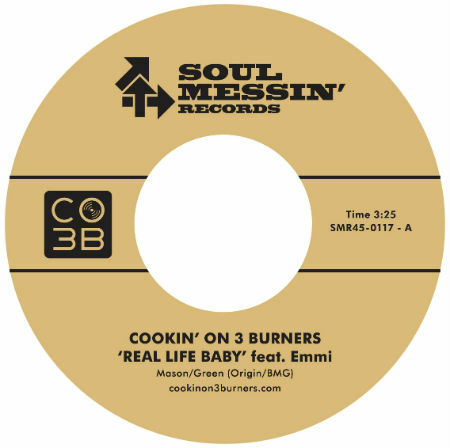 Australia’s hardest hitting Hammond organ trio Cookin’ On 3 Burners release new single “Real Life Baby feat. Emmi” in anticipation of the launch of “Lab Experiments Vol.1: Mixin”, the first installment in an exciting new series of releases. The cracking lead single was penned with UK-based vocalist and songwriter Emmi. Available as a limited edition 7-inch single, “Real Life Baby feat. Emmi” tempts you with sweet summer soul at its finest. For the B side, strap yourself in for the Cookin’ on 3 Burners breakbeat flip of the Metallica classic “Enter Sandman” – this instrumental funky dance floor banger is set to be a future classic for break dancers on the NYC subway as much as it is for you at home! If you are meeting them for the first time, Cookin’ On 3 Burners are captured here in full flight. With the right blend of soul and dirty dance floor funk that comes on strong until you get up off of that thing and move. We are therefore thrilled to present you with the announcement of “Lab Experiments Vol.1: Mixin”, 8-tracks scorched onto analogue tape and soon to be made available for your convenience on both vinyl and digital and vintage compact disc.